As things stand, bottom of the table Birmingham & Solihull are 16 points adrift of safety whilst Guernsey are only three points better off. Both teams will attempt to secure a win to keep their survival hopes alive, but a defeat for either the Bees or the Raiders, would seriously damage their chances of staying in National Two South. 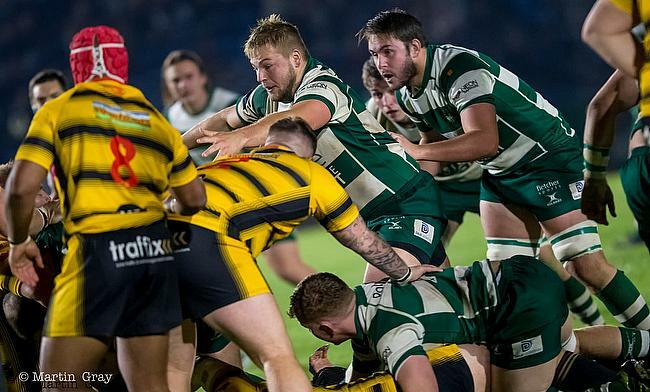 Relegation rivals London Irish Wild Geese will also be aiming to keep their fight alive as they look to build on their recent win over Worthing Raiders when they travel to Redruth in Round 22. At the right end of the league, Rams RFC can take yet another step towards the National Two South title by securing their 18th straight win, but hoping to halt their charge will be Tonbridge Juddians who are chasing a play-off spot. Currently occupying second place are Canterbury and Andy Pratt’s side visit Clifton this weekend while fellow top two contenders Taunton Titans host Old Albanian and Henley Hawks go to Worthing. Elsewhere in the division, Bury St Edmunds take a trip to Dings Crusaders and Old Redcliffians entertain Barnes at Scotland Lane. Last weekend, Rams RFC sealed their 17th consecutive win as they swept aside Guernsey at Footes Lane to stay 16 points clear at the summit of National Two South. It was another step closer to automatic promotion for the Rams, but head coach Seb Reynolds told the club website: “Anyone who thinks we are a certainty for promotion just doesn’t understand this level.” Reynolds is, quite rightly, remaining focused and not getting too carried away, but he and his side will be fully aware that the league title is now edging into view with nine games to go. The leaders can rack up a century of points for this season if they can pick up two points or more this weekend, but it won’t be a straightforward task for the Rams against play-off chasing Tonbridge Juddians. Peter Dankert’s side are six points behind second-placed Canterbury after beating Barnes last time out and TJs have lost just one of their last 13 matches which has helped propel them up to third in the table. The Rams haven’t suffered a defeat since September, but their winning record will be put to the test at the Slade this weekend. In Round 21, Canterbury took advantage as two of their play-off rivals weren’t in action following the bad weather. Taunton Titans’ clash with Henley Hawks was postponed which allowed the City Men to move six points clear of the chasing pack after a superb second-half display against Redruth last weekend. Andy Pratt’s side now have some breathing space in the race for a top two finish so they will not want their standards to slip when they travel to Clifton on Saturday. Clifton’s match with Birmingham and Solihull was called off last week so the Bristol-based side may well be feeling refreshed ahead of this encounter. Last time out for Clifton, they lost to relegation threatened Guernsey at Station Road in Round 20 so Matt Salter will be hoping for a reaction from his side on Saturday. Taunton Titans’ intriguing play-off battle with rivals Henley Hawks was postponed last weekend and Tony Yapp’s side could only watch on as Canterbury increased their advantage in second place. The Titans are now six points behind the City Men and with Tonbridge Juddians also winning, Taunton are now in fourth place, but they do have a game in hand. The Somerset outfit have won six of their last seven games so they will be keen to maintain their momentum when they host Old Albanian on Saturday. OAs were also not in action in Round 21 as their fixture with Dings Crusaders was called off so the wait for a victory for Gavin Hogg’s continued. The men from Woollams have lost their last six games and the ninth placed side are desperate for a shot in the arm which would breathe some new life into their season. Taunton have lost on just two occasions at the Commsplus Stadium this term, but can OAs upset the applecart and begin the final third of their season on the front foot? Henley Hawks’ rearranged fixture with Taunton Titans will now be played at the end of the month and that clash at Dry Leas could shape how the race for the play-off spot unfolds. In the meantime, Nigel Dudding’s side must continue to stay in the hunt for a top two finish and after last week’s results, the Hawks are now eight points behind Canterbury, but they of course have a game in hand. After successive losses to begin 2019, Henley ended January with back to back victories against Old Redcliffians and Dings Crusaders so they will be hoping to make it a trio of wins when they visit Worthing Raiders in Round 22. The Raiders suffered another disappointing result last weekend as a late kick from London Irish Wild Geese’s Liam Prescott condemned Jody Levett’s side to a fourth consecutive defeat. Worthing currently occupy 10th place in the table, but if they were to halt their blip in form this weekend, the men from Roundstone Lane could move into the top half of the division. Following two frustrating results, Bury St Edmunds produced an emphatic response in Round 21 as they thrashed Old Redcliffians to return to winning ways. Nick Wakley’s side scored eight tries in Suffolk and they moved back up to sixth place after securing just their second home win since September. The Wolfpack are back on the road this weekend and they travel to a Dings Crusaders side who weren’t in action last week. Their fixture with Old Albanian was called off and Luke Arscott’s side will now be eager to get their season back up and running in more ways than one. The Crusaders have picked up just a single victory from their last seven games, but in the majority of those matches, Dings have lost by narrow margins. Back at Shaftesbury Park, (where they clinched their last win against Canterbury in Round 17) the 11th placed side will be aiming to taste that triumphant feeling once again. An injury-hit Redruth side were second best against play-off chasing Canterbury in Round 21 as Nigel Hambly’s men suffered a 46-14 defeat at the Marine Travel Ground. Since Hambly took over the role of Director of Rugby, the Reds have lost both of their away games, but back in Cornwall, they have looked like a different proposition. Consecutive wins against Guernsey and Birmingham & Solihull has just sparked Redruth’s season back into life and they will be a hoping for a hat-trick of wins at the Recreation Ground this weekend. However, they will have to be wary of a London Irish Wild Geese side who are still fighting for survival in National Two South. The men from Hazelwood are currently 11 points from safety, but three wins from their last five matches has reignited their hopes of beating the drop. The trio of aforementioned victories have all come at home so the Wild Geese will now be keen to gain some success on the road as they continue to battle for their place in this division. After an excellent victory over Old Albanian to conclude January, Old Redcliffians suffered arguably their most disappointing result for three months as they were humbled by Bury St Edmunds last weekend. Saul Nelson’s men were blown away in Suffolk, but Old Reds will now be itching for a response when they host Barnes in Round 22. The Bristol-based side haven’t lost at Scotland Lane since the end of November so the task awaiting Barnes will certainly be a tricky one. The visitors’ poor run of form continued in Round 21 as they suffered a home loss against Tonbridge Juddians meaning Barnes have only won one of their last 10 matches. They sit one point and one place behind Old Reds heading into this encounter so a victory in the West Country would be a welcome result for Barnes this weekend. What a game to end the National Two South previews for this week. Birmingham and Solihull take on Guernsey in Round 22 with both sides still fighting for survival. Currently, Guernsey sit 15th in the standings and are 13 points from safety following two wins from their last three games. Jordan Reynolds’ side have given themselves hope after recent victories against Barnes and Clifton, but they were brought back down to earth against league leaders Rams RFC last week. The Raiders will now take the long journey to the Midlands where they will meet a Birmingham & Solihull side who currently prop up the division. Pete Glackin’s men are 16 points away from climbing out of the bottom three, but the Bees were not in action last weekend meaning they also have a game in hand. Their survival bid has been kept alive thanks to back to back home victories against Dings Crusaders and Worthing so a third successive win at Portway would be a massive boost. In truth, a defeat for either club would seriously damage their chances of staying in this division so expect a tense, but entertaining battle between the two sides on Saturday.